Honda iGX700/iGXV700 and iGX800/iGXV800 V-Twin general-purpose engines offer versatile power—expanding into larger and more demanding commercial applications for greater adaptability with excellent fuel efficiency in a compact package. At the 2019 World of Concrete show in Las Vegas, an international event showcasing leading industry suppliers and dedicated to the commercial concrete and masonry construction industries, Honda today introduced powerful new additions to its legendary GX Series of V-Twin general-purpose commercial engines. Expanding the lineup are four new Honda V-Twin engines, the iGX700/iGXV700 and iGX800/iGXV800, models that offer commercial construction and turf industry customers versatile power and greater adaptability with excellent fuel efficiency in a compact package. Providing enhanced performance and quality, the engines are equipped with fuel injection technology and an integrated electronic self-tuning regulator (STR) governor that delivers drive-by-wire remote control capability to manage key aspects of engine operation. The new Honda V-Twin engines, available in both horizontal and vertical shaft configurations, share the same footprint as existing models. The electronic governor allows the engine to regulate power when the load changes for the demanding commercial applications including concrete and construction equipment (power screeds, hydraulic power units, concrete saws, ride-on concrete trowels, vibratory rollers, generators and pressure washers) and commercial turf equipment (zero-turn radius mowers, lawn tractors, garden tractors, utility vehicles, trenchers, stump grinders and chipper/shredders). Like the current Honda GX630/GXV630 and GX690/GXV690 models, the new iGX700/iGXV700 and iGX800/iGXV800 engines feature cutting-edge design and innovative, technologically advanced elements, including a hemispherical combustion chamber, an integrated cylinder and cylinder head, forged steel connecting rods and a 9.3:1 compression ratio, contributing to high efficiency as well as low noise and vibration. In addition, the integrated cylinder and head eliminate the need for a head gasket, resulting in superior cooling and reliable performance. The integration of electronic fuel injection (EFI, see discussion below), along with the advanced combustion chamber design and the integrated Digital Capacitive Ignition (CDI) with variable timing, results in excellent fuel efficiency and enhanced operation. Efficient Fuel Consumption: Honda V-Twin engines with EFI boast excellent fuel efficiency due, in part, to an electronic control system (ECS, see discussion below) that continually monitors and adjusts the engine’s air/fuel ratio according to variable operating conditions and engine load requirements, maintaining optimal combustion conditions. Adaptability and Enhanced Reliability: In addition to optimizing air/fuel ratios, the Honda V-Twin EFI-equipped engines offer improved ignition timing over the complete range of operating speeds and compensate for other factors to continually maintain optimal performance. Improved Starting: Honda iGX700/iGXV700 and iGX800/iGXV800 V-Twin engines boast easy starting performance in both hot and cold temperature conditions, such as when the equipment is started cold or temporarily stopped mid-job. The EFI system and high-pressure fuel pump allow for an ideal air/fuel mixture before it is emulsified and vaporized. In 2005, Honda introduced the revolutionary, innovative generation of intelligent, computer-controlled iGX general purpose engines that set a new standard for ease of use, fuel efficiency and quiet operation. For the first time in the power equipment industry, engines suited for a wide range of commercial (and residential applications) would feature an integrated electronic control unit (ECU) that delivered complete drive-by-wire remote control capability and controlled key aspects of engine operation. Today, Honda broadens its existing iGX lineup—the iGX270, iGX340 and iGX390—by integrating the ECU architecture into new GX Series V-Twin models. The new iGX700/iGXV700 and iGX800/iGXV800 engines represent the pinnacle of Honda’s general-purpose lineup and serve as an extension of the GX Series commercial grade engines already known for their unparalleled durability, quality and reliability. lawn mowers that can automatically vary engine speed based on load so the engine does not slow in thick grass. Because the new Honda V-Twin iGX engines eliminate the need for manual manipulation of the choke and throttle, they also are ideal for rental applications. Additional iGX design features that users will appreciate include a digital ignition system; long-life air filter; automotive-style starter motor; low- pressure and high-pressure fuel pumps; engine temperature monitoring; and parameter-setting ECUs. Benefiting consumers, Honda iGX technology results in excellent fuel efficiency, low emissions, and low noise through engine speed that can adapt based on power demands. As a result of Honda’s adoption of the Society of Automotive Engineers (SAE) standard J1939 vehicle bus, the recommended practice used for communication and diagnostics among vehicle components, the new Honda V-Twin models offer a standardized method for communication across ECUs. The new Honda V-Twin models feature a control panel with an LED indicator that informs the user about potential problems with diagnostic trouble codes. This indicator is designed either to stop the engine or alert the operator if any corrective actions need to be taken. These alerts protect and help extend the life of the engine. The new Honda V-Twin models feature high power output in a compact design comparable to the compact base frame footprints of other high-output Honda engines, ranging from the GX630 to the iGX800. The design compatibility minimizes changing time, making it easy for the user to install the new V-Twin models when older engines reach the end of their service lives. The design also allows manufacturers maximum flexibility with current tooling and frames. The new Honda iGX700/iGXV700 and iGX800/iGXV800 V-Twin Engines bring a new level of performance, value, fuel efficiency, versatility and quiet performance to the commercial marketplace. Now the most powerful general-purpose EFI models offered by Honda, these compact engines are set to deliver complete drive-by-wire remote control capability and adaptability to a host of commercial construction and heavy-duty turf applications. The Honda iGX700/iGXV700 and iGX800/iGXV800 and V-Twin engines will be available nationally later in 2019. All models will carry a 3-year, non-declining warranty. Parts and services will be widely available via the Honda national dealer network. 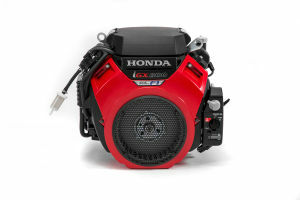 Honda Power Equipment, a division of American Honda Motor Co., Inc., markets a complete range of outdoor power equipment, including generators, walk-behind and robotic lawn mowers, pumps, snow blowers, tillers, string trimmers, outboard marine engines and small, general-purpose engines for residential, commercial and rental applications. Honda is the world’s largest manufacturer of engines for a diverse array of automotive, powersports, marine, aerospace and power equipment products. The company offers a complete line of small, general-purpose engines for industrial, commercial, rental industry, and consumer applications. Honda engines supply smooth and dependable power for thousands of different product applications including pressure washers, lawn mowers, rescue and construction equipment. Additionally, Honda engines are some of the quietest and easiest to start of their kind, even in harsh commercial and construction environments. Such attributes have made Honda engines the popular choice for original equipment manufacturers looking to add value to their own brands.